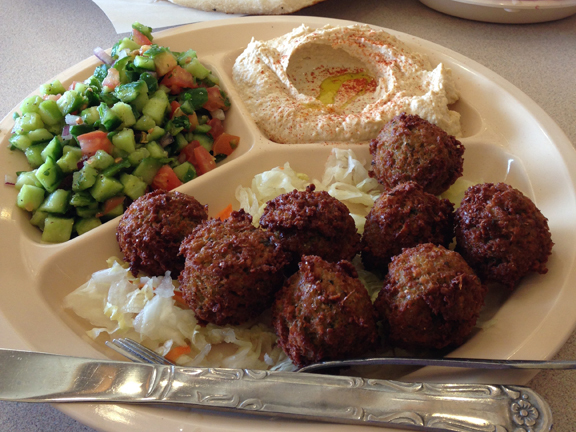 Above: the falafel combination plate at Nagila Meating Place in LA’s modern orthodox neighborhood. Maybe it’s because the climate is more mediterranean but west coast falafel always takes first place over east in my book. Usually when I return from my weeklong west coast late winter swing, I post a shortlist of the standout wines that I’ve tasted for Sotto’s spring wine list update (I’ve been co-authoring the wine list there for nearly four years). But this time around, a number of my sales reps either cancelled on me or had no new wines to show. 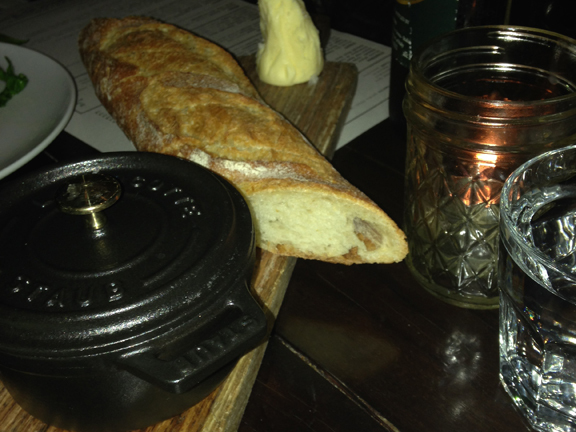 Above: I finally had a chance to taste the famous “pan drippings” at République. As silly as the dish sounds, there’s a reason why it’s so popular. The quality of the bread alone was worth the price of admission. République isn’t just one of the best restaurants in the U.S. right now. It’s also the apotheosis of how a highly profitable and overwhelmingly satisfying food and wine program can be run today. At least four of my wine purveyors at Sotto told me their containers were stuck in Oakland, the port where most European wine comes into California. 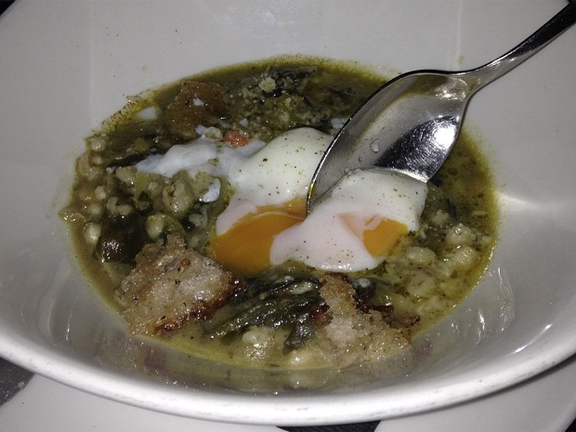 Above: Chef Steve Samson’s “Sicilian Wedding Soup” with barley, lamb meatballs, pecorino dumplings, escarole, and egg drop. His cooking at Sotto (where I co-author the wine list) is better than ever. Just look at that color of that egg! I should have some exciting news to share about my work with Steve in a few months. At Sotto, we’ve already had a couple of by-the-glasses drop off our list because of the European wine drought and reps have been telling me that the problem is much more widespread and worrisome than our microreality at the restaurant. I’m going to have to make a second ad hoc trip in March because we simply weren’t able to taste enough new wine. Above: Italian wine nerd alert! The main grape in this Lacryma Christi Bianco is Caprettone. Of the few new wines my colleague and Sotto’s wine program manager Christine Veys and I were able to taste, this Lacryma Christi Bianco by Cantine Olivella was a wonderful standout. Great acidity, great balance, and lovely white and white stone fruit and healthy, although not robust, minerality. When you talk to consulting enologists in Italy today, they tend to be dismissive of Lacryma Christi, noting that it’s an overarching, everything-but-the-kitchen-sink appellation with not a lot of direction or character. Regardless of its disfavor today, the appellation was wildly famous by the end of the nineteenth century. And it’s often referred to as one of Italy’s most celebrated wines (outside of Asti) in travel journals of the time. One of its great ironies is that its name is a blasphemy and not an unlikely allusion to Christ’s tears dropping to earth around Mt. Vesuvius as He ascended to heaven (as many would tell you). To the ears of a nineteenth-century European, the mention of Christ in reference to something as mundane as wine was wholly sacrilegious and many of the early reports of the wine observe this fact. The art of blasphemy is still very much alive in Italy and the irreverent etymology makes perfect sense: grape growers had a lot to gripe about during the age of Italy’s Risorgimento. But that’s a bigger story for another time. 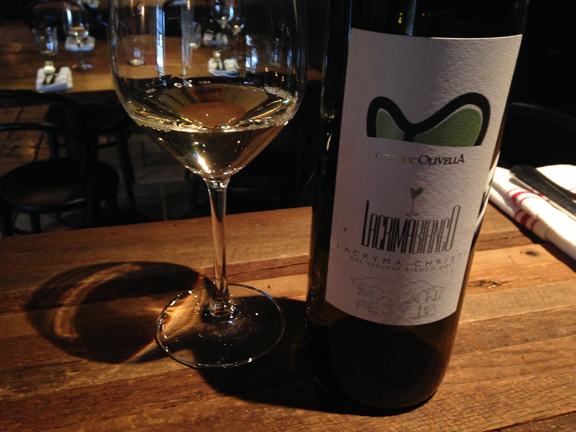 Above: I’m consistently blown away by nearly every white produced by Sardinian winemaker Gostolai. 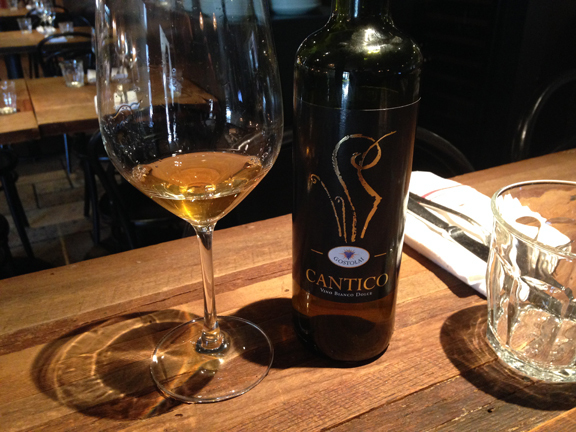 Another stand out was this late-harvest Barbagia Bianco called Cantico by Gostolai. It’s made from Vernaccia and Moscato and its delicate sweetness danced like a swan over the waters of its fresh minerality. I really loved this very soulful, thoughtful wine. Of course, with a name like cantico (KAHN-tee-koh, meaning canticle, it already had a prosody-loving wine guy like me at hello its incipit. So much to tell, so little time… Thanks for reading this prolix post!